You could squirrel away a scone in there too, for a scooby snack later. I live in Italy and I have never had a dryer! I follow regularly the adventure of all your companions ... and always smile. Many thanks for this little sunshine at every post. I LOVE your "granny green" Tupperware. Such a pretty shade, and so practical. Well now imagine my joy and glee a few years back when I discovered a pile of Tufty club handkerchiefs at a christmas sale at my son's pre school. I bought the lot and have had them secretly stashed away for about 4 years. What one? Lovely post and it should teach us all to embrace our individual and unique selves and appreciate others for the same. Good Grief, I didn't know there was such laws as forbidding hanging out the washing! Being an Aussie most of us, apart from the city dwellers in high rises hang out our washing, for those with objection to seeing others 'smalls' that is why we have the 'Hills Hoist' it is sort of like the skeleton of an umbrella without the shade, it is square and the lines go around concentrically. 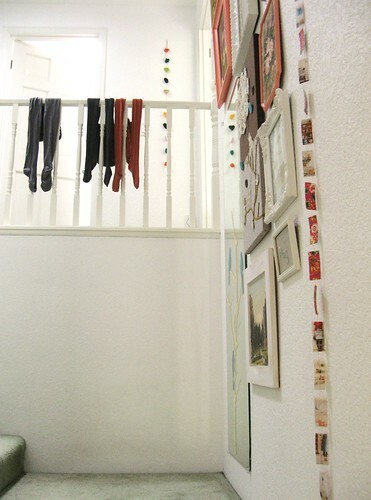 Nana's here will tell you that you must hang your undies etc on the inner lines to avoid the gaze of the neighbours. We have a drier and it is only used on wet days and here we are encouraged to line dry to reduce carbon footprints and money on power bills. Can't wait to meet this Tufty fellow is he anything like my all time hero Basil? I'm also delighted to read that people are liberating their grundies with time outdoors.... very important, I think. I cruised through your blog this morning on a trip of nostalgia.....I really, really disliked 60's and early 70's stuff, not too keen on 50's stuff but its all growing on me. I recognise wall paper and fabric and my tummy is doing butterflies, some good memories and a few bad ones have been dredged up. Where in the world are you, why can't people hang out their washing. My extra extra large 'smalls' are flapping away in the breeze as I write. Nothing like line dried washing and think of the power bill. Theres no knicker police round here. Tufty......I'd forgotten all about him, I was a member of the Tufty club back in the UK many moons ago. I think kids here in Oz have Giddy Goanna now. Wasn't there a tufty comic book. Didn't do me much good - I got hit by a car when I was six, running out from parked cars into the road, didn't learn my lesson the first time so I went back and did it a second time once I got the plaster cast off. I was probably one of those rebel kids that thought Tufty was for the goody two shoes. a trip outside with some tupperware. perfectly normal and very smart too! I had no idea there was a ban on line drying in the US! As a firm believer in the letting the breeze blow through my britches here in the UK, I'm glad you're bucking the ban! That's very odd. I must admit to a certain curiosity as to what other people have hanging on their lines. It certainly brightens up my journey on the bus! haha heehee, i knew the laundry issue would seem most odd for some. indeed when i moved here stateside i was aghast that i could not hang our undies out to bake. not everywhere is like that, but some housing developements have homeowner associations (can't spell it and darren dictionary has gone missing in action) anyhow within the laws it says 'no washing to be hung outside'... some days i would get my granny's old standing rack out and pop it out the back. i felt like a criminal breaking the law and fretted my undies would be held up at the next homeowners meeting as evidence of anarchy in the ranks. we even needed permission to paint our own front door a different color. i painted ours pink and added butterflies. on arriving back from one trip across the pond, i had a letter waiting, saying i was disturbing the harmony of the neighborhood and had one week to change it out to brown. now perhaps you can see why mossy shed has liberated me and i have found myself again! what I actually meant to say re the tufty club hankies was want one? not what one. Happy to send you a little reminder of our early road safety education! I used to be a Tupperware 'lady' and you had to buy the pieces to put in your kit as it sold easier if customers could see it. This means I have stacks of the stuff and it NEVER wears out. The other major disadvantage is odours from food leaches into the plastic and it's hard to get rid of the smell. and greedy nan, yes indeedy! the first thing i do when finding them in the thrift store is pop the lid and sniff!! I have one of those lovely celery keepers myself, and since I despise celery in every shape and form, I use it instead in my pantry to neatly hold bottles and boxes of Kraft Mac 'n cheese in place. I think it is the perfect "keeping" size and glad you enjoy it too! I just saw you full-page in the Dutch Flow magazine, did you already see it yourself? It looked really lovely! I assume they sent you a copy, but if not I'd be happy to send you one! oh my goodness! i did not know it was a celery keeper, that would explain the natty little sievy thing it came with. i now have that on my knook table holding the potholder coasters and cruet set! ha! one learns something new every day, thank you kimmie! are you serious about people not being allowed to hang out their clothes? i have never heard of such a thing. of course, i live in the country about 45 minutes from the nearest city of any size, so i have no concerns about anyone seeing anything. but man, it's your property you should be able to do with it what you want. poor city people. I have vintage Tufty road safety board game waiting to go in the shop you just reminded me! 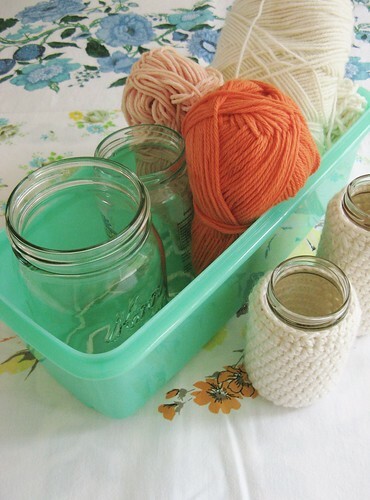 I want to crochet jam jar covers too. My next thing to learn I think after I have overcome my granny square addiction that is. The washing line debacle is really something isn't it? Oh can you imagine the washing-line-stallwarts of old Blighty taking kindly to housing associations banning the hanging of knickers outdoors?? Good Golly ! I look forward reading more about your washing-line rebellion and send you the best of British Bulldog spirit for your crusade. Being from Germany I never heard of this drying thing. Here you are going against your house rules if you are drying your laundry in your house because the humidity can cause mildew etc. Aren't those house owners afraid that the wood and the wallpaper might get damaged if people do hang their wet clothes inside and do not use a dryer? We often put fake washing out if we are away for a couple of days to make potential burglars think there might be someone home. Not the planning and checking several times kind, but the spontaneous burglar.